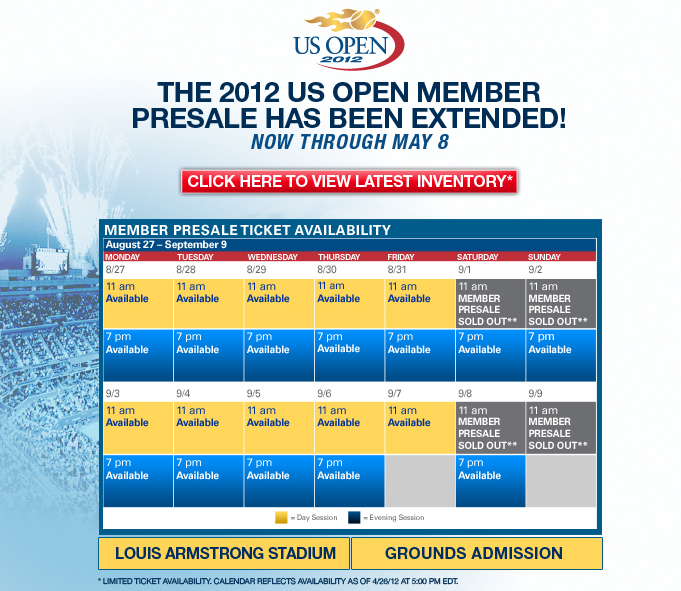 Hint: Bookmark this US Open Ticketmaster page so that you can get first dibs on your favorite seats! We recommend this offer if you are looking for tickets on Finals Weekend (Men's Final, Women's Final and Super Saturday Semi's) or Labor Day weekend, then you probably want to buy it ASAP. In years past, most of these dates get sold out much earlier and sometimes before they are available to the general public. Also if you want to catch one of the evening sessions Aug 29-Sept 1 (take advantage of the Buy 1, Get 1 Free offer). This may be a good deal to lock in early. Offers limited to current USTA members and subject to availability. Offers begin at 9:00 am EST Tuesday, April 24, 2012. Offers end Tuesday, May 8, 2012 at 11:59 pm EST. All individual ticket orders are subject to Ticketmaster service fee and handling charge. All tickets and Club Passes will be mailed in mid-July. * Each Member may purchase a total of 16 day session tickets (up to 8 per session), 16 evening session tickets (up to 8 per session) and 16 grounds admission passes (up to 8 per session). ** Offer limited to a total of 4 tickets (purchase 2 regularly priced tickets, get 2 promotional tickets free) August 27 – 30. Place order for total number of tickets, each ticket will reflect a face value of 50% off the regular price. Free tickets must be for the same session as purchased tickets. Subject to availability. † While supplies last. USTA reserves the right to substitute. Stop by USTA Membership Booth during the 2012 US Open to receive poster. † † US Open Club Passes are subject to availability — maximum of 1 pass per ticket.